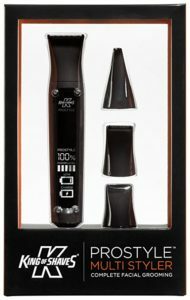 The King of Shaves Prostyle Multi Styler is a perfect grooming kit for men who have been looking for a high-quality trimmer at an affordable price. It comes with a lot of user-friendly features that make users feel very comfortable and enjoy using this kit. Also, it is made from materials that give you a good grip so that you can achieve the style that you want in the most effortless way. You don’t have to waste long hours in front of the mirror to get your stubble trimmed to perfection or to get the exact level of sideburns that you expected. Thanks to this effective kit, you can adjust your settings and go about in sporting new and different styles every day. Here is a list of the features, pros, and cons of this product so that you can understand more about this trimming kit. At just £9.99 on Amazon, this is one of the lowest-priced yet one of the most effective trimmers in the market today. Comes with adjustable trimming guides in the range of 2mm to 8mm, in addition to a 12mm guide, and 15mm guide, as well, if you are looking to maintain a longer beard. Users must note this important point – the Prostyle Multi – Styler from King of Shaves is a good grooming kit overall; however, when it comes to trimming stubble, the product has a way to go. If you are looking for a trimmed stubble of more than 1mm of length, this is not the product for you. If you are fine with shorter lengths, this product promises you full value for money and Amazon offers an excellent discount (75%) on this kit currently. This is a very basic beard trimmer. If you want something with a little more power look at our Best Beard Trimmer Reviews for a quick and easy breakdown of many trimmers.